What you will see when you go to see "Jubilee!" are amazingly designed million-dollar sets, glitter and glamour, and the best crooners this side of the Strip! Of course, you cannot forget the marvelous costuming by the legendary Bob Mackie. That just adds to the excellence of the show. You will get to see amazing spectacles and unthinkable stage feats such as a live viewing of the sinking of the Titanic, the destruction of the Temple made famous by Samson and Delilah, and more! Do not take our word for it though. "Jubilee!" features the most amazing dancers in Las Vegas. In fact, these dancers are not only known around the world, they are also considered the "Best Showgirls in Las Vegas". This was determined by a reader’s poll in the Las Vegas Review-Journal. This is what the original entertainment of Las Vegas was like. "Jubilee!" shows why Las Vegas entertainment was so popular back in the hey-day, and reaffirms why the city of Sin continues to be the entertainment capital of the world. 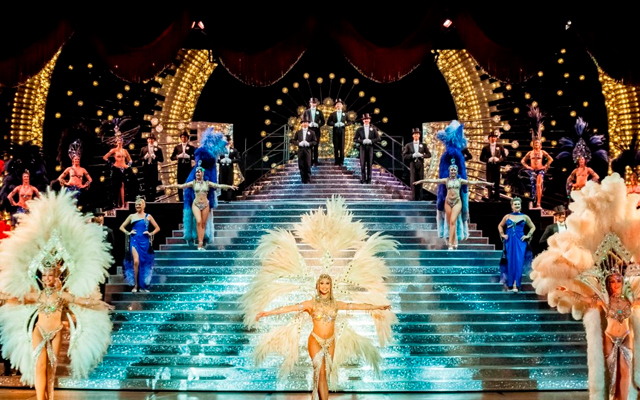 This show has been tantalizing visitors for years with its music, dancing, beautiful showgirls, and the most intricate layouts and performances on one Las Vegas stage. This is a crowd pleaser, especially since the show is constantly being updated. Visitors from across the globe keep coming back to see “Jubilee!” whenever they travel to Las Vegas. Now is the time for you to see exactly what they are talking about and why they keep coming back for more. A wonderful exciting production. Great dancing. The girls are all wonderful trained dancers. The nudes in the fabulous costumes are more like beautiful sculpture. Thoroughly enjoyed the production. Costumes are amazing!